Building the facility will be the most expensive step. This will be done primarily with fundraising. We have been granted some land adjacent to the Mission Valley Aquatic Center. This land grant is contingent upon our ability to raise a set portion of our total facilities construction cost. Our facility will begin as a roofed concrete slab and dasher boards, with a storage area for our coolant and heat exchange systems. As we continue to raise funds, we will build insulated walls, locker rooms, and a concession area. What activities will it host? This facility can host a number of events year-round, including but not limited to: hockey tournaments, figure skating competitions, curling events, public skating, ice sport workshops for youth and adults, adult and youth ice sport programs, roller skate sports and events, public gatherings, festivals, etc. How will it affect my taxes? Building this facility will not burden the tax-payers. We will build this facility with funds raised by our committee and volunteers. We may have to apply for a mill levy in the future, however, to maintain operations once the facility is complete. Why build an ice rink after the winter we had? Average skate-able days on outdoor rinks have steadily been decreasing recently. A skate-able day is considered any day that dawns on solid ice that is smooth enough to shovel and skate upon without difficulty. This season, even with some very cold temperatures, we only logged about 15-20 skate-able days on Flathead Lake and in surrounding areas. The ice was often too thin, too soft, or too rough to be considered skate-able. In addition to questionable ice, we had heavy loads of snow that made any backyard or lake rink very difficult to maintain without enormous effort, or expensive personal equipment. As soon as our local ice begins to melt, our skating season is over. With a refrigerated and roofed rink, we would have the capability to extend our very short, unpredictable skating season at least from October to March. This will further our joint efforts to continue to build a healthy and safe community, giving adults and youth a chance to participate in winter activities without putting them at risk on questionable ice. We will direct the majority of our programs toward the local youth organizations in order to provide a variety of year-round activities to children and young adults. We will also endeavor to open up the facility to local groups for a variety of events and activities year-round, including, but not limited to fundraisers, parties, stock shows, fairs, and other gatherings. Didn't we have a rink before---what happened to it? The last rink that Polson offered was very successful. As a former user, I can remember the rink being packed with people every time I skated there. The staff was fun and friendly, and the ice was well-maintained. However, the city management staff became alarmed at the misconceived “high amount” of water used on the rink, and shut the project down, to the keen disappointment of staff and rink users. With our refrigerated rink, we will use less water on average than the old outdoor rink, and this water will be paid for by the rink’s program fees and recreation district income. Each surfacing will include 13,208 gallons (50,000l) of water. I feel that we can count on many of the former rink users to come back and be a part of our project with enthusiasm and excitement, contributing to offsetting our operational costs. The Kalispell outdoor rink operates from late October through early March, and now offers curling, hockey for women, men, and youth, as well as figure skating and public skating for all ages. Their ice is booked every day, with programs running from early morning until at least 11pm most nights. This is an outdoor rink, however, so extreme weather will close it down. Missoula has two roofed rinks at the Missoula County Fairgrounds. The outside rink operates from late September through April, and the inside rink can now operate all year round, specializing in youth camps during the summer months. These rinks are booked from 6am most mornings until after midnight most nights. These rinks offer figure skating, curling, hockey for adults and youth, public skating for all ages, and rental time for events or camps and workshops. Whitefish has a fully enclosed rink now that offers the same programs as these other rinks, and is open from early fall to late spring. The ice is booked from early morning until late at night as well, and also has rental slots available for workshops, events, and camps.  All these rinks are very successfully filling their ice time, and are able to cover most operational costs with program fees and rental fees, with minimal burden to recreation district tax payers. It takes time and effort to put a sheet of ice down. And it takes a large contribution from well meaning folks like you. Take advantage of a tax deductible donation to the Mission Valley Ice Arena and help bring a rink to the Mission Valley. Sign up for our newsletter and we will get you the latest and greatest news about the Mission Valley Ice Arena as it develops!